Maxtop's philosophy is simple: provide solid, reliable cases with eye-catching and aesthetic designs to the customer, and follow that with fantastic after-purchase customer service and support to maintain a business relationship that will last a lifetime. At Maxtop, the customer comes before all other concerns, and we will do whatever we have to to make your purchase a decision you can be proud of for years to come. Opening the side panel of the case, I noticed a whole lot of wires coming from the top of the case. First, you have 2 shielded USB wires and then 2 audio wires for microphone/headphone connections. Not seeing any USB connectors or other connectors, I started to investigate further. It turns out there are two click-to-open doors on top. 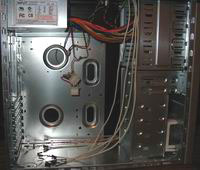 The smaller of the two doors opens to allow access to 2 USB ports, a microphone and headphone jack, and a punchout for a 1394 Firewire connector. 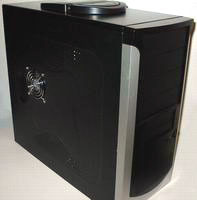 The second, larger door on the top surface of the case has an 80mm fan on hinges. When the door opens, the fan rotates up slightly, and also allows everything to be closed down for transportation. 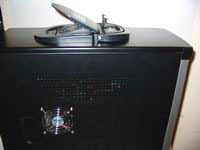 Having a “blowhole” fan can significantly reduce interior case temps. 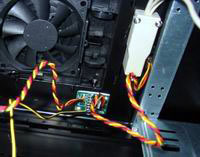 There were still way too many wires coming from the top of the case to just have one normal fan. 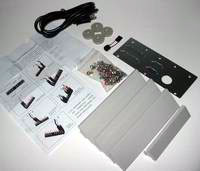 It seems that Maxtop has added not only a 3 speed fan switch, but also another switch built into the latch of the larger door that turns the fan off when the door is closed. 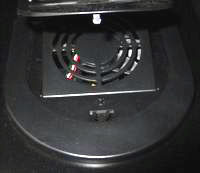 The 3 speed fan switch is located in the bottom right corner of the small door area. Part of this top assembly also pops up and becomes a sturdy handle. I had no fear of carrying this case around using the handle, even fully loaded.